The South Fork’s long season and its close proximity to Sacramento, Lake Tahoe, Yosemite and the San Francisco Bay Area make this an extremely accessible river trip. This trip starts off with a mellow warm-up, great for swimming, relaxing, and bonding with your traveling companions. By the time you’ve learned to paddle together, the river enters the Gorge; here, the rapids become more exciting, with big waves and holes which thrill novice and experienced rafters alike. 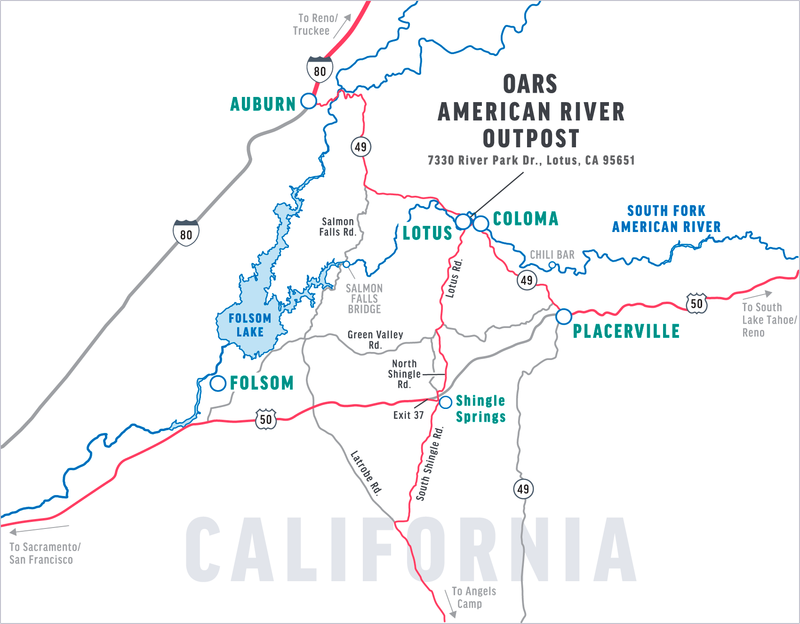 We meet next to our camp store at the OARS American River Outpost at either 10:30 AM, 11:00 AM or 11:30 AM. Roads around here are winding, so please be sure to allow for plenty of travel time. Our river-side campground and base of operations is in the heart of the twin towns of Lotus and Coloma. Our peaceful hideaway is surrounded by plenty of history, recreational opportunities and cultural activities. After you check in with your trip leader, your guides will deliver an orientation and safety talk and fit you with your safety gear. After practicing your paddle-strokes, you will head downriver towards Barking Dog Rapid and plenty of swimming opportunities. Beautiful river scenes stretch out around you, with redtail hawks soaring overhead and the occasional river otter frolicking nearby. Several miles of Class II rapids allow you to warm up before entering the ever-exciting “Gorge” later in the day. Come lunchtime, we will pull over to a beach for a delicious picnic. Your guides will lay out an abundant spread of cold cuts, cheeses, veggies and breads, or perhaps a tasty taco salad for roll-your-own burritos. Lunch is always accompanied by fruit, cookies, cold water and lemonade. There is access to a BLM pit-toilet restroom at our lunch location. The South Fork’s Gorge begins at the base of the Lollipop Tree. Here, the canyon walls constrict the flow of the river, creating an action-packed series of enjoyable Class III rapids. Such memorable torrents as Fowler’s Rock, Satan’s Cesspool and Hospital Bar are sure to get your pulse racing; remember to smile for the photographers’ cameras! After the main rapids are over, and depending on the water levels, the guides will tie the boats together for a short tow-out to the Salmon Falls Bridge. Here, there is a short, steep hill up to the parking lot where our shuttle vehicle and restroom facilities await you. Our guides appreciate help carrying the rafts and other equipment up the hill. Please feel free to bow out if you wish. After enjoying a cold soda or sparkling water from the cooler, we will drive the 30 minutes back to the OARS American River Outpost and your car, generally arriving between 4:00 PM and 5:00 PM. 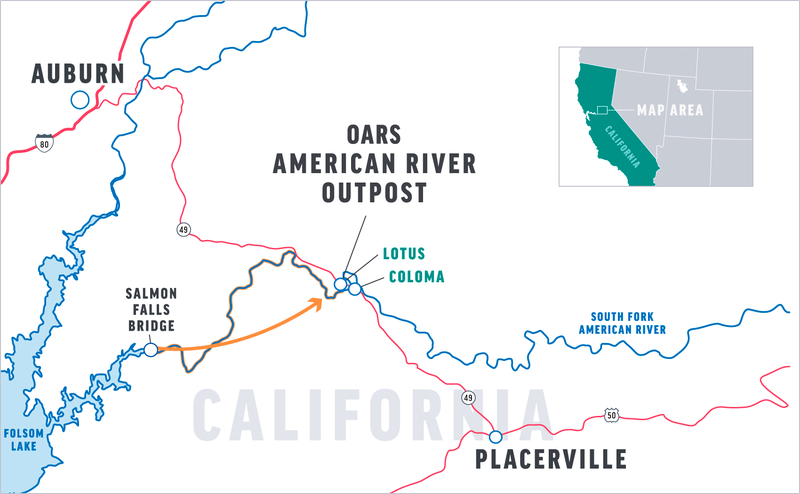 We’ll meet you near our camp store at 10:30 AM, 11:00 AM or 11:30 AM at the OARS American River Outpost, located at 7330 River Park Drive, behind Hotshot Imaging’s store in Lotus. Click here for a Google Map. Provided (early/late-season) wetsuits do not include “wetsuit booties” – please bring your own, or wear wool socks with tennis shoes as a good alternative. In reviewing your statement, you’ll notice a $1/person/day donation to the American River Conservancy, a non-profit organization dedicated to protecting the Forks of the American River. One-hundred percent of your tax-deductible donation goes toward conserving the American Rivers watershed. See www.arconservancy.org for more information. This donation is voluntary and may be removed from your invoice if you choose not to participate.